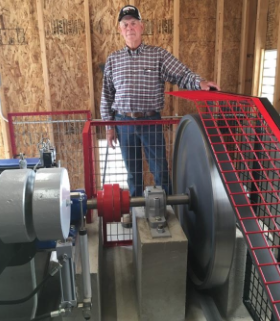 With a goal of generating 40,000 kilowatt hours, about the same amount that his center pivot sprinkler uses, Jim Park installed an innovative micro hydroelectric project on his corn and alfalfa farm in Weld county. Typically seen on the Western Slope, agricultural hydroelectric projects on the eastern plains and the Front Range are still gaining popularity and traction. 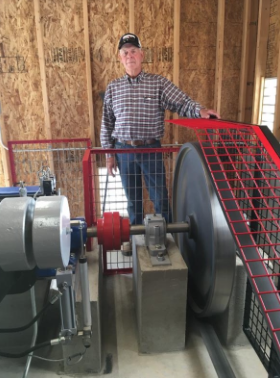 After his 20-year service as a Poudre Valley REA board member, and the owner of a 260-acre Colorado Centennial Farm, Park was knowledgeable and interested in hydroelectric generation. After receiving coordinated grants from the Colorado Department of Agriculture, the U.S. Department of Agriculture Rural Development and the USDA’s Natural Resources Conservation Service, Park ordered a cross-flow turbine generator from the Ossberger company based in Germany. Park placed the turbine at the bottom of a 25-foot slope in his irrigation diversion off the Lower Latham ditch. The turbine was manufactured specifically for his land elevation, water volume and generation needs. The ditch runs from April to November and the turbine began generating power in June 2017. Park will eventually see a positive return on his investment, and if the unit generates more energy than needed to run his sprinkler, a portion of the overage will be treated as a savings on his electric bill through PVREA. Fort Collins-based PVREA cooperative partnered with Park for this project and provided him the interconnection for it to come back to his metering.